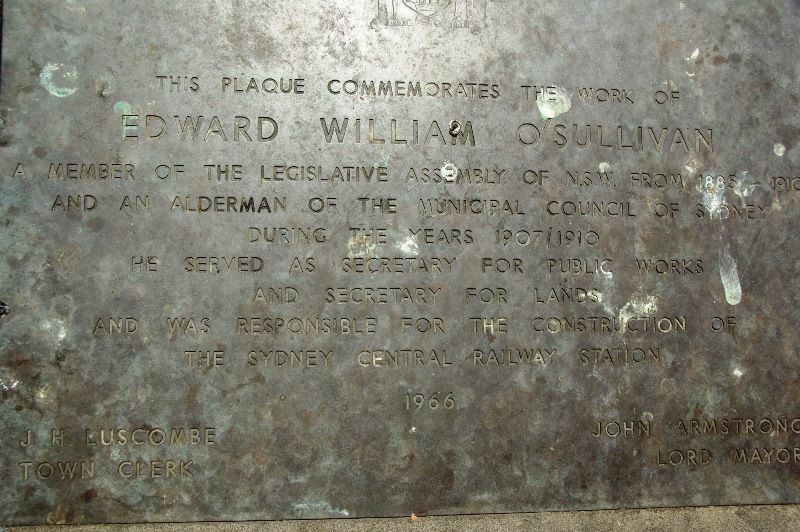 A plaque commemorates the work of Edward William O`Sullivan, a member of the New South Wales Legislative Assembly who was responsible for the construction of the Central Railway Station. 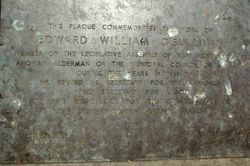 Edward William O'Sullivan (1846 – 25 April 1910) was an Australian journalist and politician. As a politician, O'Sullivan had strong Labour sympathies before the Labor Party had developed in New South Wales, and worked untiringly for old-age pensions until they became law in 1900. He was much criticized for his supposed extravagance as Minister for Public Works; at the time it seemed with reason, as the state was suffering from drought for part of the period. Possibly, however, he was wise in realizing the necessity of keeping people at work in times of depression. He was certainly right in his efforts to provide Sydney with a proper supply of water, and his efforts to relieve unemployment by developing the tramway and railway systems, showed him as a man of great foresight and courage. In September 1899, O'Sullivan became Minister for Public Works in the Lyne ministry, and held the same position when John See became Premier until the ministry was defeated in June 1904. He was a most vigorous minister and was responsible for a great development of the tramway system, for the building of many new railways, and for many other public works in connection with water-supply, roads, rivers, harbours and buildings, including the new Sydney railway station. 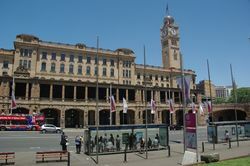 THE SYDNEY CENTRAL RAILWAY STATION.